Cookies are part of the HTTP spec that everyone has heard of thanks to dire warnings and misunderstandings about what they do since the late 1990s. They’ve been in use since 1994, and browsers just handle them automatically. Load Tester, too, handles all of the HTTP cookie specification automatically, responding to header directives for cookies just the same as any browser. The first step is to locate the cookie value. To do that find the first instance of where the cookie in question is used in the Headers Tab, double-click on the cookie line in the header to bring up the editor, and copy its value using control-C. Select the entire test case by clicking on the top node in the test case editor, and then select the Search Tab. Paste the value into the search tab and click on the search button. In this particular example the cookie value was found in transaction 66 of page 2. Click on transaction 66 of page two and select the Actors Tab. Select the Extractor tab at the bottom, and click on the plus sign to bring up the editor. Once the cookie value has parsed into a user variable you can do anything with it. 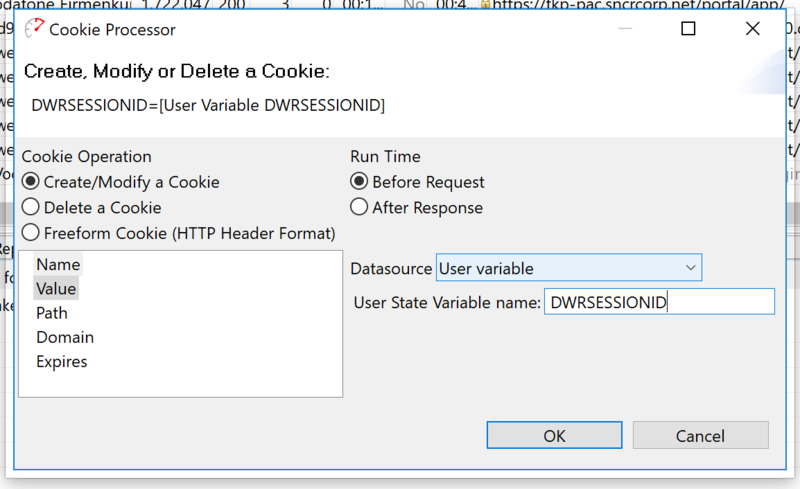 In this case, we want to set the cookie value for the cookie “DWRSESSIONID” so that the cookie processor will use that new cookie value for the rest of the test case. On the next transaction bring up the Processor Tab at the bottom of the Actors Tab. 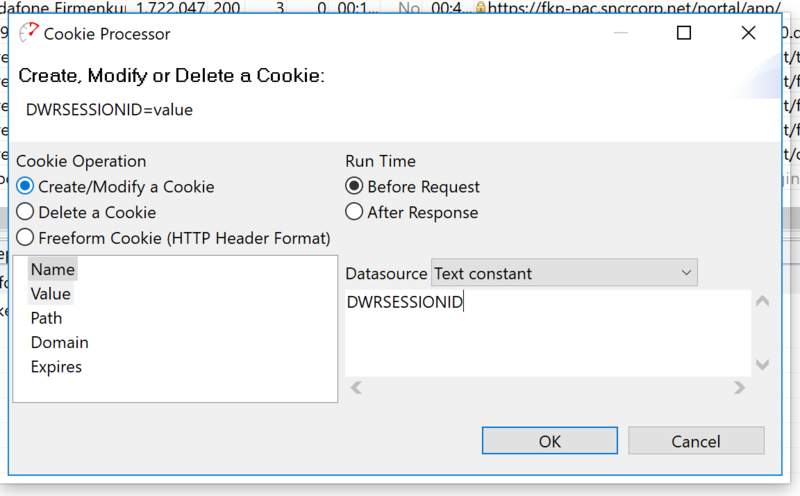 The goal is to modify the existing DWRSESSIONID cookie before this and all subsequent requests are made. The “name” should be the name of the cookie. The next step is to configure the cookie value. In this case the previously configured extractor stored the value in the user variable named “DWRSESSIONID” to make it easy to remember. 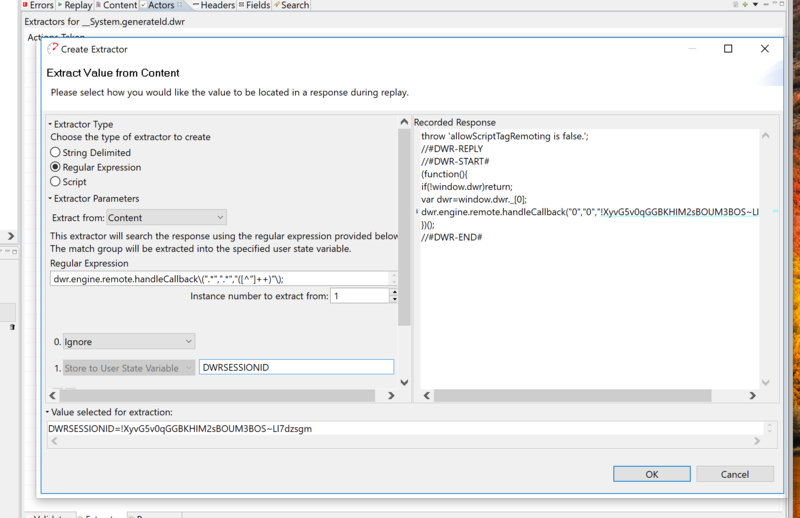 This name is then entered here, selecting “user variable” as the data source, and “DWRSESSIONID” as the variable name.